Try video conferencing servers and online video conferencing service. Tell the world about yourself and make new friends. Use the blogs and photo albums on our site. Look for people with similar interests. Communicate your preferred way and JOIN our videochat Conferendo community! 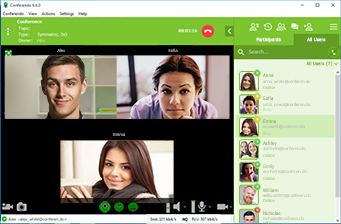 Video chat with up to 120 of your friends in Conferendo! NOW ON YOUR MOBILE DEVICE!